Preliminarmente, apresento uma partida comentada, Abertura Inglesa, "Anti-Grünfeld", que joguei recentemente contra o MF Hilton Rios Filho, nas dependências do Clube de Xadrez Guanabara (Rio-RJ). Fiz este trabalho e estudo para melhor entender a Abertura Inglesa (1.c4). Isso me ajudou a ter suficiente informação para identificar, usando partidas de top GMs, um simplificado repertório para jogar essa abertura com as Brancas ou Negras. Fiz escolhas suportadas por estatísticas extraídas do "Mega Database 2012", usando as facilidades do programa ChessBase, e utilizei o auxílio de chess engines, com “Find Blunders”, para avaliar lances (encontrar possíveis erros), com a convencional medida de "centipawns", por exemplo, [0.50] significando, em “centipawns”, que as Brancas estão melhores 0,50, ou meio peão de vantagem, ou [-1.20], significando que as Negras têm vantagem equivalente a 1,20 peão. Usei o parâmetro de 60 "centipawns" de diferença para computar um erro (blunder). Se pesquisarmos a posição depois de 1.c4 no “Mega 2012” (nov/2011), encontramos 340943 partidas. Mas existem muitas transposições para outras aberturas com códigos ECO diferentes daqueles de A10-A39. Filtrando as partidas pelos códigos ECO (A10-A39), encontrei 362733 partidas. Muitas, aqui, começaram diferentemente de 1.c4 - somente cerca de 216000 partidas (e não 341000 ou 363000) são computadas como Abertura Inglesa com o primeiro lance 1.c4, e existem cerca de 147000 partidas da Inglesa com o primeiro lance das Brancas diferente de 1.c4. Depois de excluir partidas (sem resultado; com menos de 20 lances - uma opção que fiz, muitas tinham apenas 1 lance, empates de conveniência, etc. ; partidas a cegas, rápidas ou blitz (relâmpago); partidas duplicadas e, finalmente, aquelas com primeiro lance diferente de 1.c4), o número foi reduzido para 191621 partidas. Depois disso, selecionei 899 partidas (89 jogadas pelos 5 top GMs na lista da FIDE de maio/2012, contra oponentes com ELO >= 2500; 109 partidas com ambos jogadores com rating (ELO) >=2700, de Brancas ou Negras; outras jogadas por ambos jogadores com ELO >=2600; partidas para completar todos os códigos ECO dessa abertura (A10-A39), tentando, tanto como possível, manter os percentuais de resultados similares àqueles do banco de dados de referência. 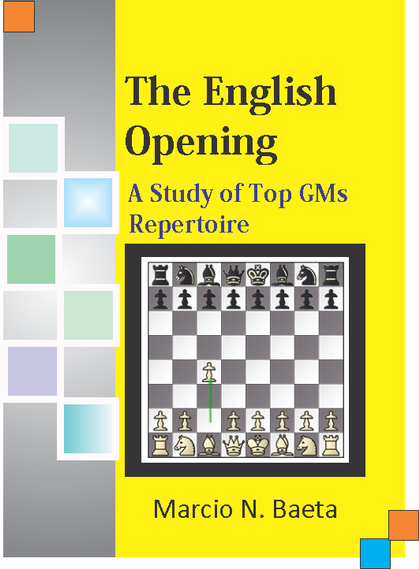 “The English opening is the 4th most common opening for White. Although the English has its own style, the opening is very flexible and many times transposes into other opening lines. The objective of the opening is to apply pressure on the center d5 square without committing the queen pawn or the king pawn. Since the move is a flank move many players like the English because of hypermodern style of play (using pieces from the sides along with minor pieces to apply pressure and control the center). White's 2nd move depends on Black's response. If Black does not immediately try to control the center White can fianchetto his bishop with 2. g3 3. Bg2 and white starts to apply even more pressure on the d5 square and gives White the control over the light squares. Many English games will start out very slow as both sides build up pressure around the center. The good thing about the English is that you can be very versatile. With all the different openings that you can transpose into, the English can be used against any opponent as you can change your game plan early on. If you like slow methodical games and like to be flexible this is a great opening to use. The bad thing about the English is there are many traps that exist to defend the English. As with any opening you should be aware of the traps that you might encounter”- Thechesswebsite.com (/Chess-openings/english-opening.php). 1.c4 Nf6 (The “Anglo-Indian”) embraces a number of defences akin to the Ninzo-Indian, King’s Indian and Grünfeld where White foregoes the move d4, giving these formations an independent turn. 2.Nc3 e6 3.e4 (The “Mikenas Variation”) is a sharp attempt to get an edge without allowing Black the opportunity to head for quiet waters. 1…e5 (The “King’s English”) is a natural reply and leads to a variety of reversed Sicilian positions, of which the English Four Knights (1.c4 e5 2.Nc3 Nf6 3.Nf3 Nc6 is, at present, the most deeply researched. 1…c5 is a sharper than its reputation and its range includes the Symmetrical Variation, the English Two Knights, the Keres-Parma Variation, the Rubinstein Variation and the “Asymmetrical” Variation, the last two options demanding serious theoretical preparation due to their complexity and popularity. The “Quenn’s English” (systems with …b6) encompasses the fashionable Hedgehog (1c4 c5 2.Nf3 b6 3.g3 Bb7 4.Bg2 Nf6 5.0-0 e6) and the obscure complications of the English Defence (1.c4 e6 2.d4 b6)” - Kasparov and Keene,"Batsford Chess Openings", Batsford, Londres, 1982, p. 9). “1.c4 e5 From the point of view of the fight for space, this is the most logical move, since the e5-pawn is more central than the c4-pawn. Black hopes to prove that the White’s extra tempo in this reversed Sicilian is not so relevant and that Black will be able to consolidate his space advantage in the long run. …A brief look at the diagram (after 1.c4 e5) allows us to make a wild guess about the draft plans of both sides. Black will be attacking on the kingside, while White will exert pressure on the opposite wing. But obviously it is too early to generalize with any certainty, because the structure may suffer radical changes” (Marin, Mihail - The English Opening", Grandmaster Repertoire 3, Quality Chess, UK LLP, 2nd ., 2010, vol. 1, p. 12). “1.c4 is a way to avoid many a standard structure of different closed games. The best Black reply is 1…c5, accepting the symmetrical pawn formation, which simplifies the problems and makes it a difficult job to gain any advantage for White. Namely, White does not achieve superiority in the centre as after 1.d4 or 1.e4. White therefore usually resorts to the KB fianchetto, but Black may choose the same weapon. The play is quiet, characterized by positional manoeuvre. The positions the English Opening consists of differ in their pawn formations and methods of play. We have to pay attention to the order of moves from the very beginning, because it is easy to lose one’s way and find oneself in a totally different type of position” (Marovic and Parma, “An Opening Repertoire for Black”, B. T. Batsford Limited, Londres, 1978, p. 69). A39 - 9 partidas da Variante Simétrica vs ...g6: 4 Bg2 Bg7 5.Nf3 Nf6 6.0-0 0-0. White scores above average (57%). White performs Elo 2689 against an opposition of Elo 2640 (+49). Black performs Elo 2600 against an opposition of Elo 2649 (-49). White wins are longer than average (45). Black wins are longer than average (43). Draws are of average length (42). Black scores below average (40%). Black scores below average (42%). Black scores above average (48%).